JACKSON, MI – A handful of Jacksonians – current and former – have adopted a common phrase to describe their thoughts on the future of the city. “Last one out, turn off the lights,” the saying goes. But that’s not the attitude of most city officials or Jackson entrepreneurs. And they’re putting up the investments to prove it. The collective focus is on downtown – with hopes that a vibrant downtown eventually spurs growth throughout the area. 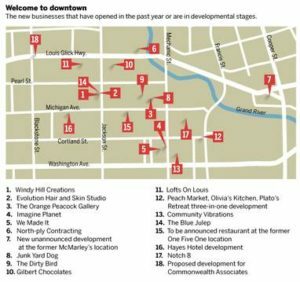 Here’s a list of a few of the newest elements added or coming to downtown Jackson. How does Jackson change its fortunes and become a thriving, desirable city of the 21st century? There’s already a plan in place. In Jackson’s heyday – the mid-1900s – people dressed up to come downtown. Residents frequented department stores like Fields, JCPenny and Jacobson’s and dined at places like the Rose Room and the Cortland Room. The largest retailers in town already lined Michigan Avenue from Blackstone to Francis streets when Penney’s came to town. But across the country, department stores relocated to malls and restaurants closed down, leaving downtown cores barren and lifeless. Jackson was no exception. You could roll a bowling ball down Main Street without hitting a car, said Rick LeMaster, who owns several downtown properties. A shrinking city didn’t help matters. Employment declined in Jackson, with companies like Goodyear and Clark Equipment moving out of town in the 1980s. Over the years, the national perspective on downtown areas began to change. Slowly, urban cores across the country became assets again. Is it time to invest in Jackson? Just like the shift from downtowns, Jackson didn’t escape effects from the 2008 recession. Unemployment peaked at 15.7 percent in the metropolitan area in July 2009, according to the U.S. Bureau of Labor of Statistics. The vacant, dilapidated houses diminished home values across the city. While values have started an upward trajectory again – which Burtch credits to the demolition of nearly 700 homes in Jackson – residual consequences remain. They serve as a reminder of a bygone era — these thousands of vacant homes that dot the landscape of the city of Jackson. To help finance some larger projects, the city of Jackson has offered tax abatements – allowing select new developments to be property tax-free for a few years. A vacant plot of land doesn’t bring in any property taxes at all and does little good for the city, LeMaster said. While the Neighborhood Stabilization Program started just five years ago, the beginnings of the blight dates back decades earlier. Other business owners agree the city is on the right track, saying the tax breaks allow structures to get off the ground while creating a larger, long-term tax base with new businesses and residents. Though some downtown projects – including the Lofts on Louis – are receiving tax abatements to build, other developments are budding without help. LeMaster, who first opened a business in downtown Jackson in 1998, owns the properties of three new restaurants in downtown Jackson – The Dirty Bird, Junk Yard Dog and The Chase. He’s also putting apartments above multiple downtown businesses – of which the demand is so high, LeMaster stopped adding names to the waiting list. After years of urban decline, he sees the perspective shift – citing excitement among millennials to live, work and play in downtown cores. While the Jackson skeptics remain, the city of 33,000 people has watched its unemployment rate drop to a 10-year low in September, to 4 percent. As downtowns look to rebrand, the future has a different look than successful downtowns of the 20th century. A handful of redevelopment projects downtown will set the standard for future success – replacing the department stores and manufacturing jobs that previously propped up the town. One such redevelopment project is the Hayes Hotel. The downtown landmark opened in 1926 as a first class establishment in the heart of downtown. It has sat vacant since 2003, after serving multiple uses. HRS Communities has a $27 million plan to revitalize the historic building as hotel, retail, restaurant and apartment space. 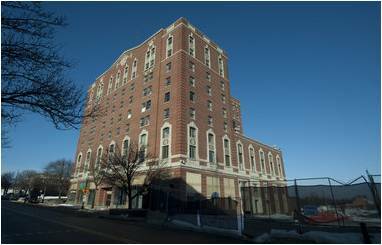 A slew of Senate bills could help fund the Hayes Hotel revitalization in downtown Jackson. HRS Communities leads projects across Michigan, including some of the first condominiums in Royal Oak. While they could have picked from a number of projects to invest in, they chose Jackson, Morgan said. Their goal is to start a snowball effect of downtown investment, she added. 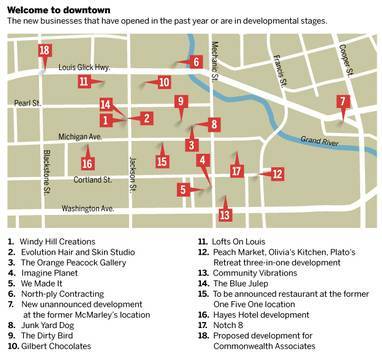 A downtown map, showing new businesses that have opened or announced plans in downtown Jackson since December 2015. While downtown Jackson can be hopping at lunchtime as employees take a break from work, city visionaries say it’s crucial to get people living downtown – inspiring nightlife. Business and city leaders also consider Burtka’s Lofts of Louis project a catalyst for future growth. The $5.4 million project at 209 W. Louis Glick Highway broke ground in November, and tentatively includes an urban grocery and 30 apartments. The Lofts on Louis downtown Jackson development took hold after an unassuming meal at the Grand River Brewery. Burtka also owns the Grand River Brewery, 117 W. Louis Glick Highway, and plans to develop the former One Five One restaurant at 151 W. Michigan Ave. Following early successes at the brewery, other downtown eateries sprouted up. Burtka hopes the Lofts on Louis project has similar development-driving results. What is the vision and how long will it take? The resounding hope from Jackson entrepreneurs and city officials is for more – more restaurants, more living space and more entertainment. It’s not a dog-eat-dog atmosphere among downtown Jackson business owners. They shop at each other’s stores, lend napkins to neighboring restaurants and actually hope for additional competitors. While they may not get the same percentage of “the pie,” LeMaster said additional businesses bring additional business. In the mid-1900s, people came downtown simply to “come downtown.” There were enough places to shop, eat and be entertained, without needing a plan in advance. By creating enough individual destinations, Jackson itself becomes the destination, Bradish-Orta said. How long does this process take? Bradish-Orta, Burtka and Clifton all believe the vision for downtown Jackson will be realized within three years. Burtka’s vision has inspirations from Ann Arbor, where the streets filled with people on a regular basis. As Jackson government and business leaders look to revitalize the city, here are the cities they want to model after. Downtown amenities aren’t far off, either. CP Federal City Square is already on its way up – offering a community gathering space for movies, concerts and other events. City and county officials are also discussing a proposed downtown launch site to the Grand River Water Trail, allowing kayakers a break on the trail spanning from Vandercook Lake to Lake Michigan. Other ideas include a bike-sharing program, expanded downtown park area and the proposed independent league baseball team and stadium. On the business end, more than 18 businesses have either opened or announced progress in downtown Jackson since December 2015. With the recession over, housing values on the rise, businesses opening and ideas flowing, Burtch believes it’s time to be positive about Jackson again. His plans aren’t trivial – as he shoots for 200 to 300 people moving downtown within five years and another 10 to 15 restaurants. He’s been criticized since starting as city manager in 2012 for pushing out the old to start the rebuild. “When a community has gone down as fast as Jackson has – it’s taken 70 years to get here – but once it gets to a certain point, it keeps spiraling,” Burtch said. “If you don’t do something to interrupt it now and move fast in the other way, the momentum is just too far against you.